Tribhuvan University, Institute of Science and Technology (IOST), Dean Office Kirtipur notifies its constituent and affiliated colleges to conduct re-entrance examination for Bachelor of Science (B. Sc) 2075. This is a wonderful opportunity to the students who want to pursue Bachelor of Science (B.Sc) at Tribhuvan University but missed the earlier entrance exam examination. The candidate must have completed 10+2 or equivalent examinations with Minimum 'C' grade in all subjects . 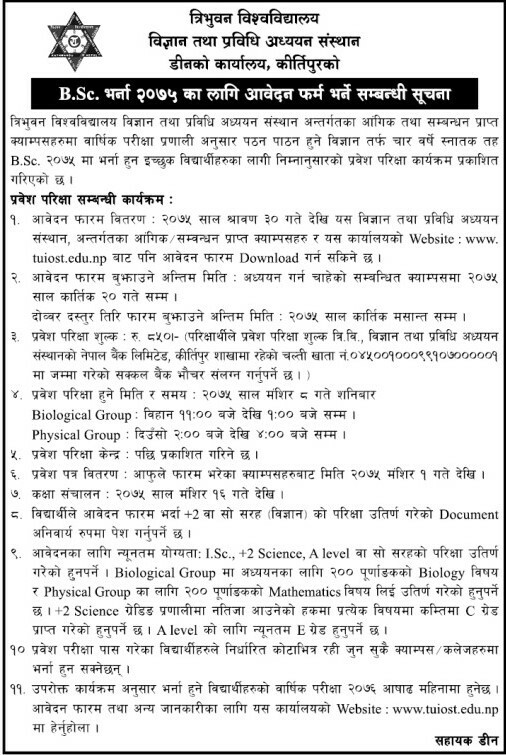 Tribhuvan University, Institute of Science and Technology (IOST), Dean Office Kirtipur announces admission under its constituent and affiliated campuses for Bachelor of Science (B. Sc) 2075. Interested students should fill the application form by Kartik 20, 2075 ( 6th November, 2018) . Application form can be obtained from the constituent/affiliated campuses of Institute of Science and Technology (IOST) and can be downloaded from https://www.tuiost.edu.np. Examination center will be published later.